A report by Barrons compared the predictions of analysts from Citigroup, FBR Capital Markets and Gartner; reports from each differ widely on the number of tablets that will be sold next year, but all agree Apple will lead the pack. Citigroup's estimates say 35 million tablet devices will ship in 2011, with Apple's iPad representing three quarters of the total (around 26 million), giving it a share of the market similar to the company's dominant position in music players with the iPod. Citigroup sees 400 million PCs being sold next year, but estimates that growth in tablets will come at the expense of 11 million PCs (which would have been sold had the iPad not shaken up the market). That's enough to have prompted the group to reduce its expected growth of the PC market from 12 percent to just 9 percent over this year's sales. Craig Berger of FBR Capital Markets says Apple will sell 40 million iPads next year, and that other makers will mange to sell another 30 million. He indicates that every 2.5 tablets sold will result in a lost PC sale, or a total of 28 million fewer conventional PCs. 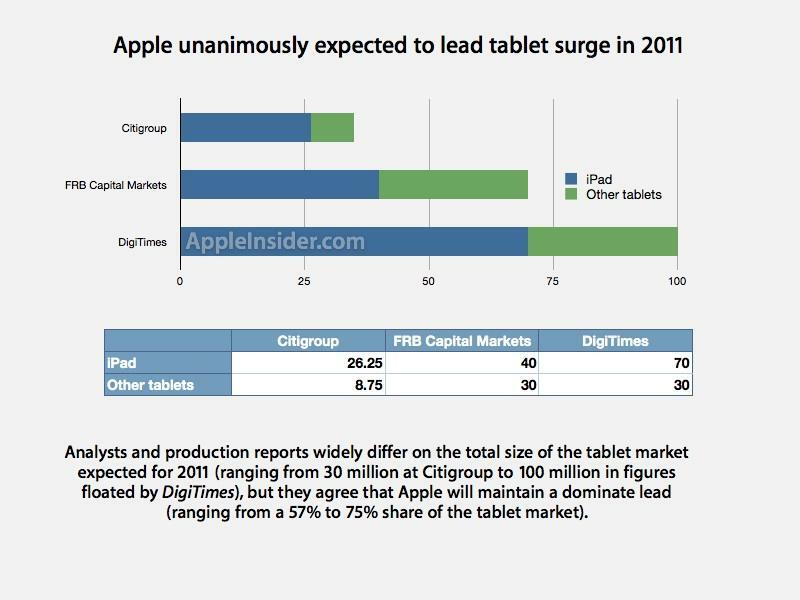 While often missing the mark on its reports, DigiTimes has reported Apple is gearing up manufacturing to reach annual production of 70 million iPads, and expected other makers to contribute an additional 30 million to tablet sales. Gartner noted that the last quarter of PC sales was "the weakest in several years," but does not include iPads in its definition of PCs sold. Apple's sales of iPads are cutting into PC makers' profit margins, including Apple's own. Of course, Apple also enjoys the fattest profit margins of PC makers, thanks to its ability to attract buyers to machines with a higher average sales price. Company executives began warning about more aggressive prices on upcoming products, a ruthless strategy intended to keep the iPad from repeating the mistake of isolating a leading product into an upscale market niche as it did with the Macintosh in the late 80s. By leveraging the vast economies of scale inherent in building tens of millions of iPods and iPhones, Apple can sell the nearly 10 inch iPad for the same price or less than competitors can afford to sell their much smaller 7 inch tablets, which Apple insists can't deliver a differentiated experience over existing smartphone-class devices the way that the iPad can. While Apple's successful growth in entering the existing smartphone business has been duplicated and in some cases exceeded in sales volumes by Android, Googles operating system hasn't produced competitive music players or tablets, both markets that were largely defined by Apple with the iPod and iPad and, in the case of the iPod, a market Apple maintained a dominant position in for years even under the onslaught of supposed "iPod-killers" promised by Creative, Sony, Microsoft, and others. Meanwhile, rival PC makers are left to use Microsoft's Windows 7, which hasn't done well in the Tablet PC/Slate PC market before; or adopt Google's current Android OS, which the company itself doesn't yet recommend for tablet-sized devices but is already being sold on devices such as the Galaxy Tab; or use Google's still unfinished Chrome OS, which delivers a browser-centric experience. Other companies, including RIM and HP, have decided to build their own iOS competitors, with RIM embarking on a new tablet environment for its PlayBook that pairs the QNX kernel with Adobe's AIR (a derivative of Flash) to provide a development environment for apps and the overall system. HP's acquisition of Palm and its WebOS promises to bring another option to the tablet market sometime next year, sporting the web-based environment that didn't help Palm remain self sufficient in its efforts to rebuild its smartphone business with the Palm Pre. HP's previous attempt to deliver a Slate PC running Windows 7 failed miserably.